In your WinWay TradingExpert or TradingExpert Pro package, look for the icon for Reports and open it. The Market Log is toward the bottom of the list on the left. Trading and investing becomes clearer when you’re armed with this snapshot of the market and SP 500 stocks every day. While looking through the seasonal trends in stocks and currencies, we decided to start running the seasonality scans on the S & P 500 groups. As a reminder here are the criteria we consider when running this. Our study looks at 7 years of historical data and looks at the returns for all groups in the S & P 500 for the month of July from 2006 to 2013. We do make an assumption that the month is 21 trading days and work our way back from the last day of the month. July also has the July 4th holiday and a half day trading on July 3rd. if the last day of the month falls on a weekend, then we use the first trading day prior to that date. We make no assumptions for drawdown, nor do we look at the fundamentals behind such a pattern. We do compare the group to the market during the same period and look at the average SPY gain/loss vs. the average group gain/loss. This helps filter out market influence. Finally we look at the median gain/loss and look for statistical anomalies, like meteoric gains/loss in one year. Here are top 5 performing groups based on average return. Average return alone is misleading. In the seasonal analysis we need consistent patterns in the price action throughout the periods we are testing, in this case 7 years. While The S & P 500 Motorcycle manufacturers group (MTRCYCLE) looks good on average, it includes one stellar July of 37.50% back in 2010, and has 2 July’s that were negative returns. NOTE: there’s only one stock in the group (guess which one that is!). The office REITs group (REITOFC) is more consistent. It has an average return for the last 7 years in July of 6.50%, with the last 6 years Julys all positive. There are no stellar months skewing the average. The group also contains only one stock, Boston Properties [BXP]. Interestingly the other consistent group in July is another REIT, the Diversified REITs (REITDIV). It has an average return for the last 7 years in July of 6.06%, with the last 6 years Julys all positive. There are no stellar months skewing the average. The group also contains only one stock, Vonando Realty Trust [VNO]. A quick check on what the market did during the same period reveals an average return of 1.83% with 4 gaining Julys and 3 losing Julys. The Oil & gas Equipment group (OILGASEQ) also had a decent average, but is more volatile over the past years, however the last 5 years have all been gainers. When the Dow Breaks, the Sectors will Fall…. …and down will come, well just about everything, as far as I can tell. OK, for the record maybe it should say “If the Dow Breaks.” After all I am still firmly ensconced here at “Camp Bull.” I would like to attribute this to disciplined nerves of steel, but it would be an understatement to say that that would be an overstatement. The truth is my crystal ball broke a very long time ago (sadly I continued believing what it portended for a long time before I realized it was actually broken). So I have long since held dual citizenship in “Camp Trend Follower”. But I have got be honest…..I am feeling the urge to run like a sissy through the woods to “Camp Yikes”. Defining the “overall” market is something of a crapshoot these days, as some of the “overall” market seems to be going one way and another part of the “overall” market seems to be going another way. In Figure 1 we see the Dow, the S&P 500, the Nasdaq 100 and the Russell 2000. In a nutshell, the “Generals” are still marching but the “Troops” are in retreat. Now every market pundit seems to be offering up their opinion as to whether the “Generals” will ultimately lead the troops higher or the other way around. With my crystal ball still out of order I must unfortunately go with my stock answer here of “it beats the heck out me.” And “hey things are swell here at Camp Bull.” But I have been around this business long enough to remember several instance where the “Troops” led the way (1984, 1987, 1990, 2000, 2008) and the “Generals” followed. So we’ll see what we see. OK, just in case that little segment was not foreboding enough, let’s get to the really “scary” part. 2. This is a mid-term election year. I also do a lot of work with sectors and sector funds as I have found that investing at the right sector at the right time is – all kidding aside – one heck of a great way to invest. *Between the close of May trading day 3 and the end of September (for the record, October tends to be an OK month during mid-term election years – more on this topic in a future article) during each mid-term election year. The results appear below in Figure 2. If you are squimish you might want to brace yourself. Anyone notice a trend? To see just how bad things can be, once you are able to work yourself back up out of the fetus position, take a glance at Figure 3, which shows the three worst performers during the May-Sep mid-term year period – FSAIX (-71%), FSELX (-71%) and FSHOX (-79%). Now I have an obvious flare for the obvious (which I think should be pretty obvious – also I tend to repeat myself) but I am not even going to comment on Figures 2 and 3. The one mistake you should not make based on looking at these numbers and charts is to assume that it is not possible to make money in sector funds between May and September of mid-term years. It just requires something better than a buy and hold approach. Several momentum systems and seasonal plays that I have developed over the years have still managed to show some pretty good gains historically “among the ruins” of midterm election summer months. But if you’re gonna play, you’d better bring your “A” game. Repeating now – I am still in “Camp Bullish.” And ideally I’d like to spend the summer. There seems to be a lot of fear and loathing among the “crowd” that I follow regarding the stock market. Typically that’s a good thing and suggests that the stock market just might surprise everyone this time around. And I hope that it does. If there is one is universally true statement that I can make about trading systems in general and in specific, it is this – they sure are fun when they work. When I first started trading – back in what I longingly refer to as the “Hair Era” in my life – I figured that I would be a “gut” trader – i.e., I was determined to rely on my keen instincts and intuitive reasoning to decide when to buy and sell based on current market conditions. That was not fun. After continually getting sucked into the swirling vortex of emotion – not to mention the abject fear associated with seeing your money disappear – I found that I was getting the, um, back of my front so to speak, burned so many times that I was having difficulty, um, sitting down, so to speak. Eventually I evolved into a systematic trader. Now I am able to sit down much more often. A few strategies that I have developed over the years have stood the test of time and become something of “bread and butter” strategies. And they sure are fun when they work. To wit…. – After the close of the last trading day of the month identify the five Fidelity Select Sector funds that have the largest gain over the previous 240 trading days. – For this system, ignore Select Gold (ticker FSAGX). If FSAGX appears in the top 5 funds then skip it and include the 6th highest rated funds. – If fewer than five funds showed a gain over the previous 240 trading days, then hold cash in that portion of the portfolio (i.e., if only 3 funds showed a gain, then 60% of the portfolio would be in those funds and 40% of the portfolio would be in cash). – If you sell more than one fund at the end of a month, then rebalance the proceeds in the new funds being purchased (example, you are selling Funds A and B and buying Funds C and D. You have $12,000 in Fund A and $10,000 in Fund B. Split the difference and put $11,000 each into funds C and D). Figure 1 displays the annual results of this method. Figure 2 displays the current portfolio. My opinion as to why this system has performed well over the years is, well – what else – simple. The effects of a positive change in the fundamentals for a given industry or sector typically take a long time to play out. Thus, by finding the sectors that are performing well you very often find the sectors that are most likely to continue to perform well for a while. *First off, sometimes people new to momentum investing will look at the charts in Figure 4 and say “Whoa, these things have already rallied sharply, I’m not jumping into those.” That’s something you’ll have to get over to use this system. *Secondly, while the long-term yearly numbers look pretty good, there was about a 45% drawdown along the way in 2008. So it is not for the faint of heart. *One other danger is that some people see +48.8% for the year in 2013 and get it in their head that this will occur again often. History suggests otherwise. Best of Good Fortune in 2014. The Stock Trader’s Almanac, put out each year by the Hirsch Organization, is one of my favorite publications. Interesting ideas are one thing. Interesting ideas that actually work are entirely something else. And the Almanac is chock full of just that. Of course, some of us are not content to leave well enough alone (Hi, my name is Jay). 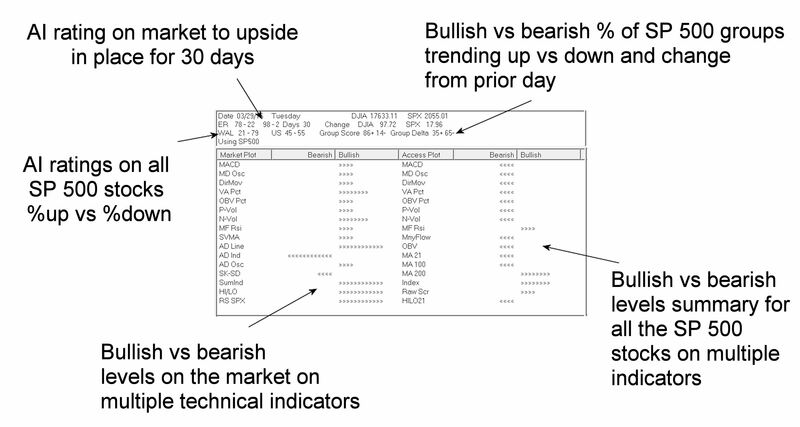 One system that I follow involves using the Almanac’s “Nasdaq’s Best Eight Months Strategy” with MACD Timing. However, instead of buying a stock index I focus on the top performing Fidelity Select Sector Funds. -Starting on October first, track the action of the MACD indicator for the Nasdaq Composite Index using MACD parameter values of 8/17/9. -When the fast line crosses above the slow line – or if the fast line is already above the slow line on 10/1, a buy signal occurs. Figure 1 displays the most recent buy signal which occurred at the close on 10/15/13. -Then find the five top Fidelity Select sector funds. There are a number of different ways to do this. The method I use is to run AIQ TradingExpert Relative Strength report over the past 240 trading days. This routine looks at the performance of each fund over 240 trading days but gives extra weight to the most recent 120 days. You can use different variables, or you can simply look at raw price change over the previous 6 months to come up with a list of “Top Select Sector Performers.” The list for 10/15/13 appears in Figure 2. -Buy the top five Select Sector funds the next day. -Starting on June 1st of the next year, track the action off the MACD indicator for the Nasdaq Composite Index using MACD parameter values of 12/25/9. The test period used here starts in October of 1998. The year-by-year results of this system during the Favorable eight month period versus the performance of the S&P 500 Index during the same time appears in Figure 3. So does any of this mean that a portfolio of FSAVX/FBIOX/FBSOX/FSCSX/FSESX is sure to make money and outperform the S&P 500 between now and June of 2014? Sadly, no. I guess I’ll just have to take my chances.